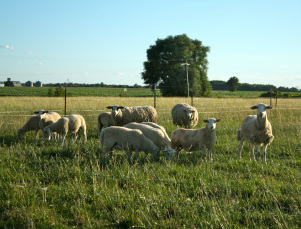 We raise commercial ewes (female brood sheep) which mean that they are cross bred and we use a Dorper ram on them. Together they produce a wonderful meat. It is very flavorful yet mild in taste. If you've never tried our lamb before, I highly encourage you to do so! Our lambs are raised on the farm from the time they are born until the time that they go for processing. 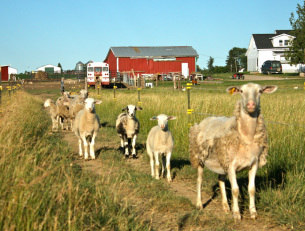 We have a closed flock, meaning that we do not buy any other sheep to add to the flock. Our lambs are born late March and processed late November at the age of 8 months. Raising sheep is very enjoyable! They are easier to handle than cattle even though we can go out and pet most of our cows, the sheep being smaller make it easier. And in the spring when you see 30+ lambs running around playing, that's enough to put a smile on anyone's face! Of course it has its challenges like anything does. We run our Great Pyrenees dogs with them to protect them from any predictors. We also have a wonderful border collie named Maverick, whom loves helping herd them up when needed. He also rides in the tractor with me since the day I got him!